Even though artificial Christmas trees have been in the stores since Halloween (maybe even earlier?) – I usually wait until after Thanksgiving to do any kind of holiday decorating. Putting up the Christmas tree is usually a good activity to help work our way through our Thanksgiving food comas on Black Friday. In between grabbing online shopping deals, of course! We are solidly in the artificial Christmas tree camp. I like to make things easy – and pulling a tree out of a box ranks right up there. 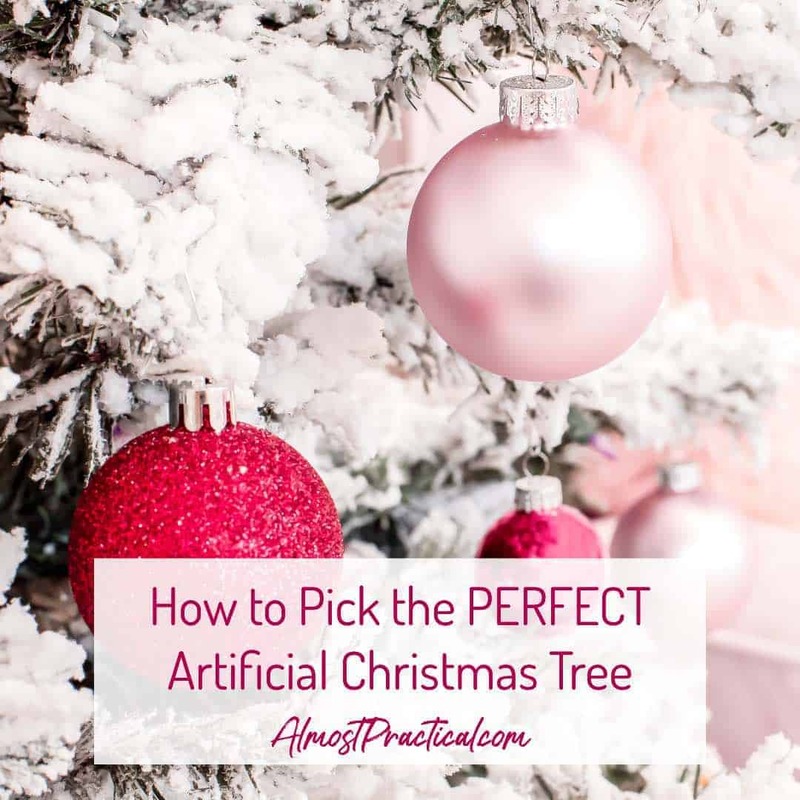 Although it is easy to set up an artificial tree – buying one is entirely a different story. With so many options to choose from – it is actually more of an ordeal than heading out to the tree farm to grab a real one. Thankfully, you only have to do this once in a blue moon – because you can use an artificial tree for many years. So, how do you pick the right artificial Christmas tree for your home? The first, and most important thing to consider is size. Once upon a time, in our old home – we had a great big, beautiful, artificial Christmas tree. But the space in our current house is much more limited so, not only did we have to downsize our stuff – we also had to downsize the tree. Knowing your ceiling height is key – you need room for the tree and the star or topper. Remember that scene in Elf? Don't be that person. The width is also important. The only spot for our tree is in a shallow corner that sees a lot of traffic. So we needed a narrow artificial Christmas tree to nestle in there without getting in the way. Size also is factor when it comes to storing your tree the other 10 month of the year. Even though newer artificial trees fold up easily – the bigger ones still take more storage space. So, artificial trees come in a rainbow of colors and materials. You can go from green to silver and everything in between. For a traditional fir looking tree that mimics the real deal – you can get different branch styles too. I prefer the flatter shredded plastic needles because the tree looks fuller. The disadvantage with these is that they tend to shed all over the place – especially as the tree gets older (or maybe it just seems that way). But there are also molded plastic needles that look more realistic. Pardon my sarcasm – but seriously, untangling Christmas lights is worse than having teeth pulled, amiright? I LOVE prelit Christmas trees. The lights are evenly spaced, don't get tangled, and all you have to do is plug the tree in. The down side is that you can't be fickle when it comes to the color of lights that you want because they are kind of permanent. I like going with white lights for this reason. You can always add color via your ornaments. You don't want to waste time searching for that one bad bulb. Artificial Christmas trees come with all sorts of embellishments these days. From snow dusted tips to berries and bows – you can get just about anything your heart desires. Again, I tend to go with the simple because I want my ornaments to stand out. Some people prefer a really elegant looking tree with color coordinated ornaments and bows – in fact I ooh and aah over these all the time. But our tree is more of a family history. We have ornaments that my kids made over the years and even some that I made in my childhood. We also have ornaments from our many travels and significant life events. How you decorate your tree is entirely up to your creativity. I don't consider an artificial Christmas tree to be a disposable item. The more we can do to reduce waste is better for the environment. So if you want your tree to last throughout the years, you should invest in a high quality product. Balsam Hill has some of the most beautiful artificial Christmas trees and decor that I have seen. So, are you an artificial Christmas tree fanatic or do you go with real? Do you have any tips to share about picking the perfect tree? « What Black Friday Deals Did You Pick Up? We too are firmly artificial tree and just had to buy our second tree a year or two ago when 1/3 of our tree refused to light. Our tree actually mixes the molded plastic needles with the shredded plastic. I do wish it was a bit fuller but I find once it’s decorated no one notices that it’s not as full as our last tree. I was thinking the same thing about our artificial Christmas tree the other day – it could be a little fuller. I did see a tutorial on another blog where they cut up an artificial evergreen garland and sort of stuffed the gaps with pieces of garland. I never considered many of the points you brought up and they all make such good sense. And as I am in the market for a new artificial tree this is very timely and terrific advice. Thank you so much for sharing and Merry Christmas.